As this present cycle runs its course to begin its ascent upon the next evolutionary spiral, the structure of the material field is showing signs of extreme decay. Individually and collectively we face the deterioration of our socio-sexual, political, and religious structures, and witness the proliferation of environmental degradation, war, famine and genocide across our Earth. There is a renewed collective calling to achieve a level and strength of personal transformation that ultimately impacts the global reality, a form of transformation that provides both deliverance from personal suffering and a clear understanding of how changes at the fulcrum point of individual awareness will impact the morpho-genetic influence vital to sustainable enlightenment and conscious evolution on a planetary scale. At this time of challenge, we now have an opportunity to align with the higher physics of creation to resurrect that most awesome piece of biotechnology: the Human. This will require the acknowledgment of our totality. Not only are we physical, mental and emotional beings, we are electromagnetic beings. The map of the evolution of the Human entity is indelibly written into our genetic codes. Our ability to activate and integrate the fullness of these codes is a question of circuitry. The Template links alchemical ceremony with brain chemistry, bio-circuitry, the endocrine system, DNA, the archetypal arena and the morphogenetic field to reveal the holonomic system of creation which births and binds the Human hologram. The Template ceremony codes are an intelligent patterning of information that acts as an alchemical catalyst to activate dormant Human potential, initiating a journey of healing, forgiveness, remembrance, resurrection and, ultimately, transcendence of the dualistic mortal paradigm: a journey of liberation and empowerment, to retrieve the knowledge of our true history, our soul’s lineage, and our celestial seeding. As units of Human bio-circuitry, we are the culmination of a variety of life-force energy systems. The new frontier of healing lies in the knowledge that these systems are not fully connected. The energetic nature of consciousness that fosters all life is integrated by the Human heart-body-mind via bio-circuitry. The circuitry is the delivery system that integrates this Source Intelligence, translating this energetic electromagnetic life-force into the bio-informational matrix that is the vibratory infrastructure of the Human hologram. As a result of the genetic modification of our DNA the Human bio-computer is not capable of sustaining its molecular structure in a state of super-consciousness. The reconnection of circuitry restores the fundamental energy supply intrinsic to the Human ability to achieve and sustain conscious evolution into the new paradigm. This electromagnetic energy is integrated into the body through meridians or circuits, to be translated by the chakra centres into bio-informational signals for the endocrine system to utilize. The circuitry does not begin and end around the Human energy field. Each circuit is spherical and intersects with another spherical field of conscious energy, which, in turn, interacts with another, as part of an electromagnetic intelligence system that encompasses all – from the subatomic to the multi-universal, the wheels within wheels. Each sphere of consciousness is a holonomic fractal of Source Intelligence. The Source is everywhere. The more circuitry the Human entity is able to utilize within its computational system, the more Source Intelligence it is able to integrate and synthesize, and the more conscious and enlightened that entity becomes. Enlightenment is not simply a state in which the intellect is in possession of questions and answers – it is a state of being in which the full spectrum of Source Consciousness is integrated, synthesized and crystallized into the incarnate body presence, understood in the mind, felt in the heart and made tangible in the body. As we witness the acceleration of the deterioration of our environment, social, political and economic structures, it is beneficial to understand the evolutionary influences that are driving this age. By so doing we can consciously implicate ourselves within the phenomenal opportunity for transmutation that is available during this phase of culmination. It is the transitional phase of conception and deterioration in any cycle which creates the powerful frictions that open the portals for transcendence. It is during the degenerative phase that the rotting fruit falls away and the new seed is expelled. The global crisis is not a dark event but a redistribution of natural power created by an immense influx of light. This influx is being created by the maturing influences of a solar system that is itself reaching higher and higher states of cosmic comprehension, transmitting to Earth and its inhabitants ever new spectrums of radiance data – light. Massive beams of this ‘hyper-creation code’ are emanating from the Galactic Core to sweep their influence through the solar system, activating and integrating the symbiotic evolutionary covenants that lie dormant and waiting in every cell of every living creation for this kiss of light to awaken them to a new model of existence, a new paradigm. In order to do so, we must have some ability to understand the implicate order of our own creation and, to some degree, the complexity of the reality in which we find ourselves. No living thing within creation exists in isolation. The interconnected, interactive, co-creative individual system of each entity is a fractal of the one holographic system that encompasses the subatomic to the multi-universal. Transcendence requires the resurrection of the dormant components within the Human hologram, to be re-embraced into the governing mechanism of the universal holography. 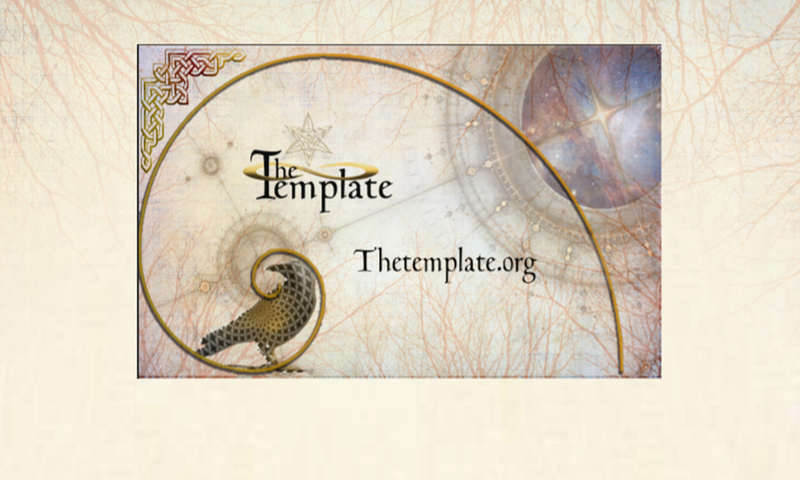 The Template reconnection process restores 33 bio-circuits, through a spoken code and the presence of items of sacred geometry. It takes place in six phases in a series of coded ceremonies: C1, Original Innocence: C2, The 13th Circuit, The Sacred Marriage: C3, Sacred Breath: C4, Source: C5, The Temple of Time: C6, Worldbridger. The design and progression of the ceremonies are combination codes which, through resonance, build synergy with the vibratory structure of the DNA, reconnecting bio-circuitry ..permanently. This initiates the return to wholeness, re-establishing our true identities and freeing us from the fear-based matrix that rules our deepest behavioural patterns, and connecting us to a new consciousness grid. The Human Soul Covenant contains a holonomic symbiotic code in which the Human is the sensory organ of planetary transcendence as Earth is the sensory organ for Human transcendence. The codes of the Template ceremonies resurrect our ability to translate and utilize, through our physical bodies, the language of light – to achieve, literally, en-light-enment. The Template is not for a spiritual elite but for everyone of any age, race or creed who wonder what is happening to our mother planet and to those who are sustained by Her: who feel, however dimly, the stirrings of the remembrance of their quintessential identity.